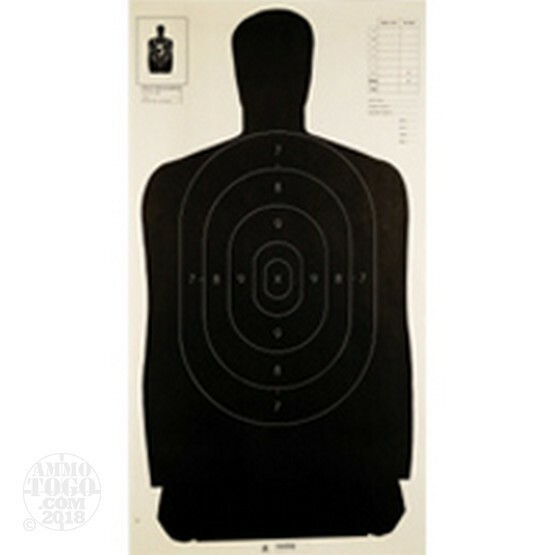 B27 style targets have long been a staple of law enforcement shooting qualifications and also make a great, inexpensive standard for personal defense training. Buying in bulk with this 100-count pack could help you set up a local match, conduct a training course, or just pad your personal stash of range supplies. Champion manufactures these targets using high-quality paper that won't rip or tear during regular transport. Each sheet may be easily hung, pasted, or stapled into place. Each target measure 24 inches wide by 45 inches tall and features a silhouette with classic ring-style scoring sections that surround a bullseye marked by an "X." The black color is easily seen both indoors and outdoors and helps to hide hits on target; this dissuades shooters from trying to confirm their hits during a string of fire, which confuses focus and ruins sight picture. The top left portion of the target also has a smaller diagram which can be utilized for rifle zeroing or more precise handgun shooting.